When I met my husband Mike things moved really quickly. After spending nearly every single day together from the day we met I moved in with him after only 8 weeks. (I know, crazy!) That was 9 years ago and now we have been married for 8 years and have four kids. On our journey we have moved over a dozen times. I have become a pro at packing and unpacking. I can instantly walk into a house and have it looking like a home. Since we have moved quite a few times because of Mike’s job we choose to rent but that doesn’t stop me from adding color and character wherever we are. I love acquiring cheap or free furniture and giving it new life, thrift store finds and clearance priced goods to decorate my home with. I mix everything up to create rooms with a bit of new and a bit of old. Moving is always hard but once everything is set up and familiar pieces are surrounding us any house we live in feels like our home. Come on a bit of a home tour with me where I’ll tell you about all my finds! 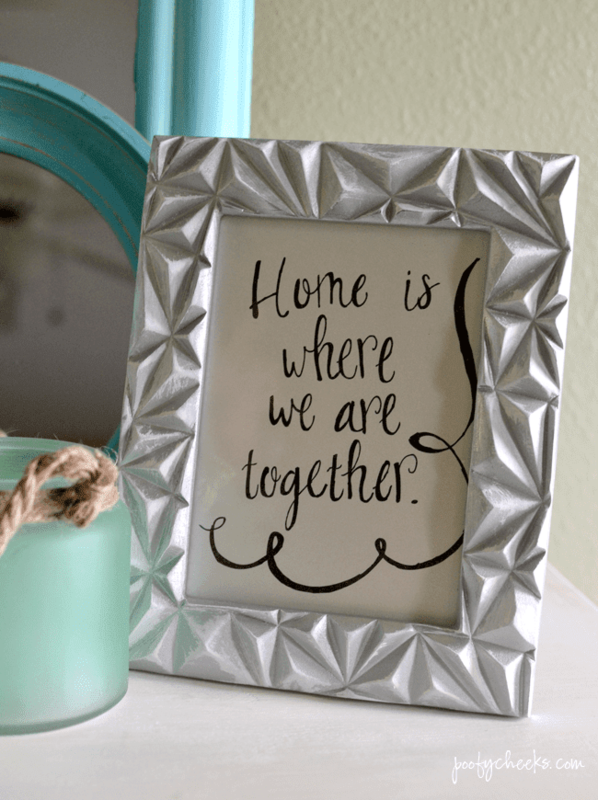 This frame above is a $3 clearance find from TJ Maxx with a hand lettered Home is Where we are Together printable. The framed mirror was a $5 garage sale purchase given new life by painting the frame. The glass jug was a wine bottle I took the label off of to reuse as a vase. The rusty gear was purchased from an antique extravaganza for a few dollars and the rest of the items were clearance section finds. 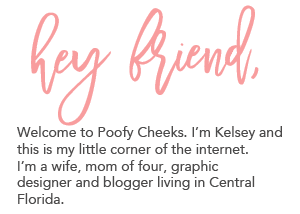 My craft room is getting a bit of a redo so consider this a sneak peek! I made the mason jar shelves, painted the circle frames which I received from my sister-in-law and my dad helped me build the white ledge shelf for just a few dollars out of 2x4s. About a month ago my sister-in-law also gave me a French provincial dresser she had in her craft room. She had spray painted it a glossy black. I sanded down the top and stained it and then used chalk paint on the body of the dresser. It is now at home in our master bedroom. Our bedframe was given to us from my mother-in-law and painted the same blue as the dresser. It is a Bombay style bed which I have yet to finish. Our master bedroom is the next room to receive some major TLC! I collect jars for my craft supplies. I often remove the labels, clean and spray paint the lids of pickle or jelly jars. If you can’t tell I also love messages of inspiration and each room of our house has some sort of sign or quote. Another item given to use by my mother-in-law was this two tone chalk desk. 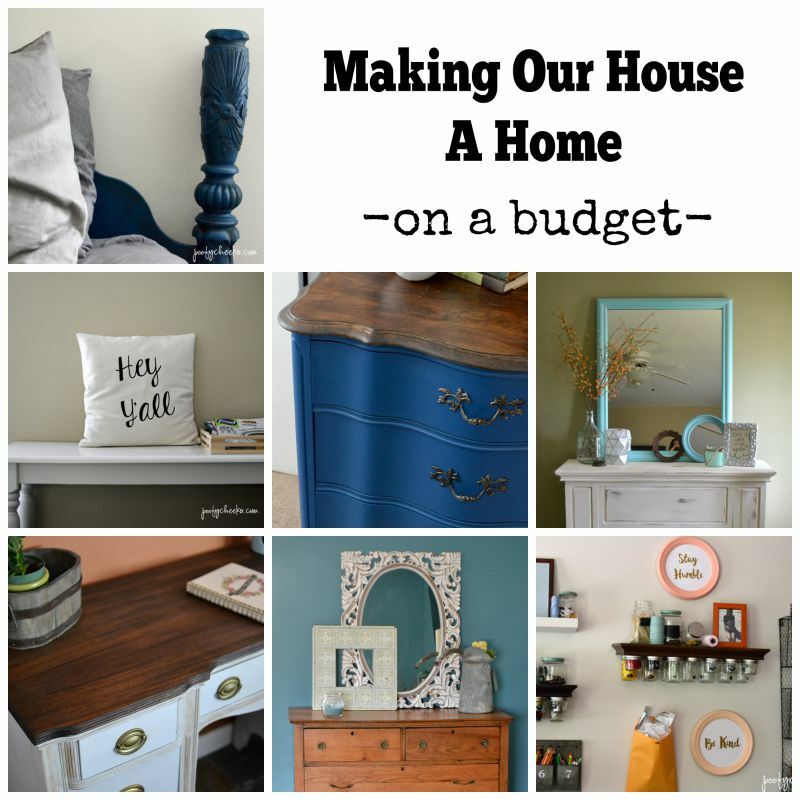 I did the same thing to the desk as I did to the dresser in our bedroom – sanded and stained the top and chalk painted the body. You won’t believe the before and after! Again my garage sale find mirror which sits on a piece I picked up at a local thrift store. I paid $60 for the faux mantel and turned the opening into shelves. In our last home my two oldest boys had a shared Avengers Super Hero bedroom with ledge shelves my dad helped me build, an oil drip pan magnet board and clearance bean bags. I fell in love with the gray wall color I used in their room. It was bright and uplifting rather than cold and dark. A corner of our room was turned into a nursery area for Emmett. By hanging things all around the crib it truly made the corner feel like his own little space. Most of all I love my craft and office spaces. No matter where we have lived I have spent the most time making sure the space is bright and inspiring because it is where I spend the majority of my time every day. My dad built the sawhorse desk for me as a birthday gift about 5 years ago and it goes wherever I go. Most importantly home is where I am with my family but all of the sweat I put into the pieces of furniture and décor around our home make them much more meaningful. I develop a stronger attachment to the pieces I spent hours transforming. Lately my oldest boys have joined in by helping to sand or paint and I couldn’t be more proud!